Tables are going fast! . The NPT Region III fall craft fair has already attracted some of our areas most creative crafters and candy makers! Vendors from Scentsy, Lularue, and Paparazzi jewelry have already reserved their space! The craft fair is to benefit this year’s SkillsUSA competitions at both state and national levels. It will be held at Region III November 18th from 9:00am to 3:00pm. 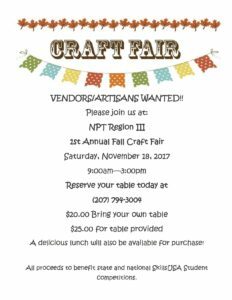 Region III is still looking for any vendor, artisan or crafter who would like to reserve a table and participate in this exciting event. . Contact Region III at 794-3004 to reserve your space today! $20.00 if you bring your own table, $25.00 with table provided by Region III. A delicious lunch will also be available for purchase. Admission for this worthwhile community event will be $2.00 with many opportunities for door prizes and giveaways!